A slightly incomplete post but something I’m too excited about to sit on. Via a friend who is versed in the dark arts of 3D printing I have got my hands on a print of one of my very own designs. Once I have access to my main computer and modeling paints I’ll be putting up an image of the original file and the completed model but for the moment here we are. 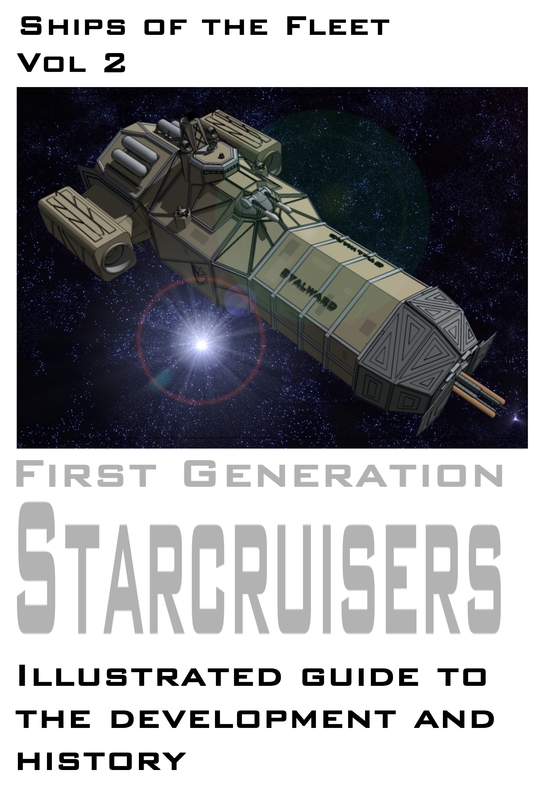 This book will be covering the development and history of Battle Fleet’s first generation of star cruisers through the Contact War. For fans of the Nameless War this will be an opportunity to get a more detailed look at old favorites like Mississippi and Hood. In the next couple of weeks anyone on my Mailing List will be receiving samples. The end of the Contact War saw an inevitable drop in the tempo of starship building as the exhausted but victorious Battle Fleet paused to take stock. By necessity, the first generation of human warships had been hastily designed and built. Within their limitations they had performed well, but equally there had been glaring flaws. These mostly manifested themselves in the form of poor fuel efficiency and reliability, as well as excessive heat build-up, which in turn limited jump range. All of these problems stemmed from a common source – humanity’s incomplete understanding of the advanced space faring technology it had obtained. The fleet’s first and at that point only battleship the Resilient, was beyond the point of economic repair and with the pressures of time and military necessity removed, there seemed no reason to seek a replacement for her. The fleet wanted time to mature the core technologies the next generation of ships would rely on in smaller cheaper vessels, before embarking on another major construction project. In the decade following the war, the role of the battleship and whether it even had one, was the subject of an at times ill-tempered debate within Battle Fleet. Three competing schools of thought formed, all of which cited aspects of Resilient’s short life as evidence in support of their views. The first envisioned the battleship as the primary assault ship, shielding the smaller cruisers during the approach before pinning down enemy heavy units in close combat. The second argued for their deployment as defensive units, much as Resilient had been originally conceived, best kept close to Earth and fixed installations, where they could sacrifice range and habitability for combat capacity – in essence a semi-mobile fortress, drawing fire away from the cruisers. The final school saw battleships as expensive and unnecessary luxuries that reduced the number of all-important cruisers the fleet could field. What the three schools did have in common was the belief that the battleship was of secondary importance to the cruiser and also that its role extended no further than the edge of Earth’s solar system. With such divided counsel it is scarcely surprising that the fleet opted to build no battleships at all. It was only in 2042 with the failed invasion of Dryad by the Tample star nation of Rizr, that clarity and urgency was brought to the question. While defeat of the invasion finally put to rest lingering suggestions that Battle Fleet was an organisation that had outlived its intended purpose, fleet commanders were uncomfortably aware of how close they had come to defeat. The fleet had correctly estimated that clash between humanity and the Rizr would pit quality against quantity. With this in mind, tactical planning emphasised using speed and manoeuvrability to gain advantage. However, tactical conditions had forced most of the Battle Fleet units to stand their ground and engage in a straight up fight. The brand new River Class cruiser Amazon had taken significant damage holding off the Tample and but for the efforts of the aging raiding cruiser Onslaught, would likely have been overwhelmed. The Tample star nations weren’t the only threat. The Aèllr Confederacy’s Defence Fleet, after a decade of muddled thinking, had arrested its slow decline and was starting a major new shipbuilding programme. Not only was something more powerful than a cruiser needed, but a vessel that could operate beyond Earth’s solar system. To this end Battle Fleet requested funding for the construction of a class of three battleships. In 2042 authorisation was granted for two. 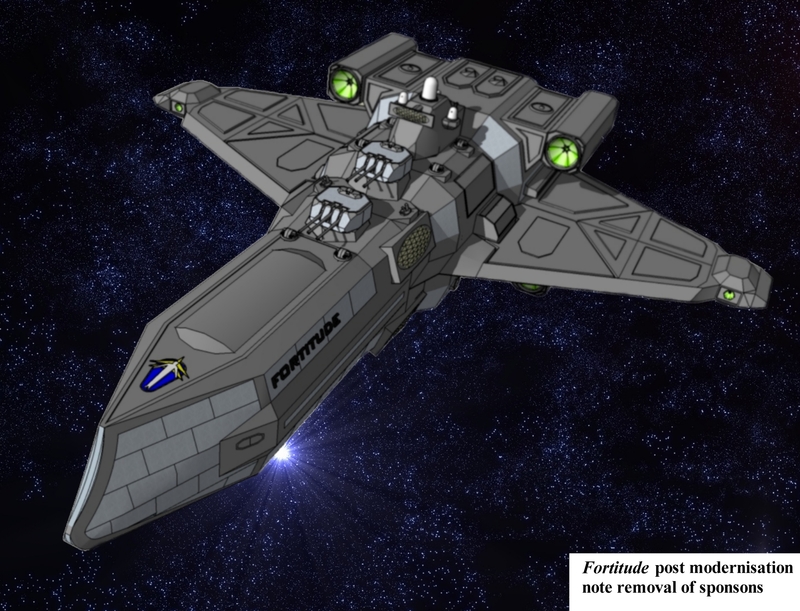 Unlike Resilient over a decade earlier, Fortitude would not be limited to cruiser dimensions. Larger dockyards were now available and the fleet was determined to build to the limits of those docks to achieve a better and more rounded design. After exploring a number of alternatives, the design team’s first offerings followed approximately the same layout used in the fleet’s post-war cruisers, with the main armament in four turrets, with the rear pair raised so it could to superfire. Unlike the cruisers, these turrets would each mount three guns, which would grant the capacity to bring all twelve guns to bear across a wide arc. Fuel and stores would be sufficient to reach Dryad without refuelling. Propulsion would come from four of the brand new Rolls Royce Double Zeus engines, which promised a level of acceleration that would actually exceed most contemporary cruisers. Finally, the greater dimensions provided space for enhanced command and control facilities, which would allow the ship to serve as a command vessel. While fleet commanders were broadly impressed, it was felt that a gun armament only fifty percent heavier than the Continental Class Cruisers that were also under design was inadequate and might see the ship quickly rendered obsolete. Quad turrets and a third pair of turrets mounted on the flanks were examined and rejected. Instead, the design saw the return of sponson weapon mounts for the first time since the Contact War. This gave the ship a total gun armament of sixteen plasma cannons, up to fourteen of which would be able to fire into the broadside. In addition, the ship would have four missile launchers in fixed mounts. Armour would be substantial, not only in terms of thickness but also in the percentage of the ship’s volume that would be protected. It was calculated that the main armoured belt would be immune to plasma cannon fire beyond forty thousand kilometres. With design accepted, construction began in 2044. Fortitude was approximately ninety percent complete, on schedule and – rather uniquely for a government contract – on budget, when fleet intelligence dropped a bombshell. By means that remain classified, reading had been obtained from the commissioning tests of the Confederacy’s Rqwe class battleship, Avar. Intelligence sources had been puzzled by the fact that despite being of markedly larger than Fortitude, these newest Aèllr capital ships mounted only eight guns. Data obtained showed that while still plasma based, these weapons were more destructive per shot, with longer range. Dubbed heavy plasma cannons, these weapons effectively rendered Fortitude obsolete before she had even entered service. Work on the ship was suspended for nearly a year as the fleet undertook a crash programme to develop its own heavy plasma cannons. However, it soon became apparent that these weapons would be too big to fit into Fortitude’s turrets. To enlarge these, the barbettes they rested upon would have had to be widened, which in turn would have meant virtually rebuilding the ship. The fleet reluctantly concluded that to modify the ship to accept the new weapons would be cost prohibitive and politically damaging. Therefore the ship would be completed as originally designed. The second ship of the class however was still at the preliminary stages of construction and ultimately this vessel would be completed as the first of the Resolution class battleships. 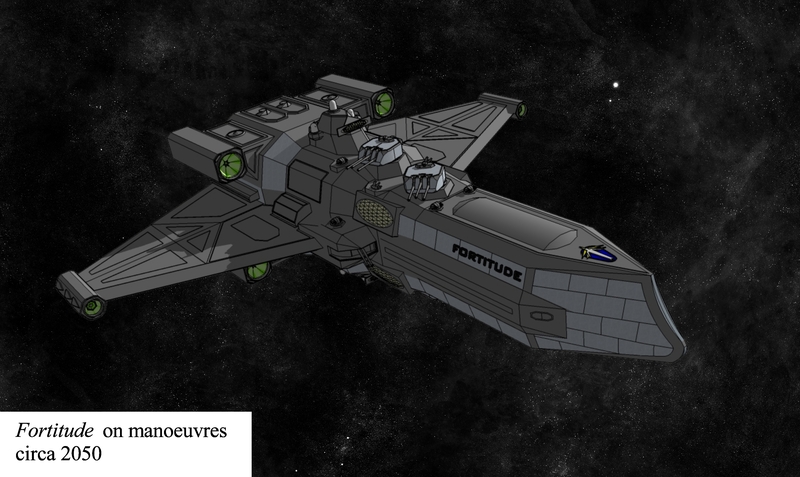 While unquestionably outmoded by the time she entered service, Fortitude was by a wide margin still the most powerful human starship yet built. Upon commissioning she was immediately stationed at Dryad as flagship for the newly formed Second Fleet. It is widely believed that her presence during this period was the single largest factor in dissuading the Tample star nation of Rizr from making a second attempt to seize the system. While Fortitude never engaged Tample ships in combat, between shows of strength and goodwill tours, she became a regular sight among the star nations. Fortitude served with no more than routine maintenance for thirteen years. It was only in 2058 that she was finally withdrawn for a by now long-overdue modernisation. The reason she had soldiered on for so long without significant modification was due to disagreement at the highest levels over what to do with the ship. Aside from the deficiencies with her armament, she had performed well. However, that weakness left her occupying an uncomfortable middle ground – too weakly armed to stand in the line against her Aèllr contemporaries, yet equally just too slow to match the pace of the newest generation of cruisers. The preferred option would have been to rebuild the ship to match the specifications of her half sisters, in effect turn Fortitude into a Resolution. But the global depression in the 2050s, with its knock-on effects on the fleet’s budget, ruled this out. Instead the fleet opted the go down a different route. During the Contact War activities of the raiding cruiser Onslaught had succeeded in forcing the Aèllr to station a significant number of first line warships around Confederacy worlds and their main shipping lanes. However, as a lightly armed and virtually unarmoured vessel, Onslaught had been vulnerable to combat damage, making any encounter with an armed opponent a gamble. 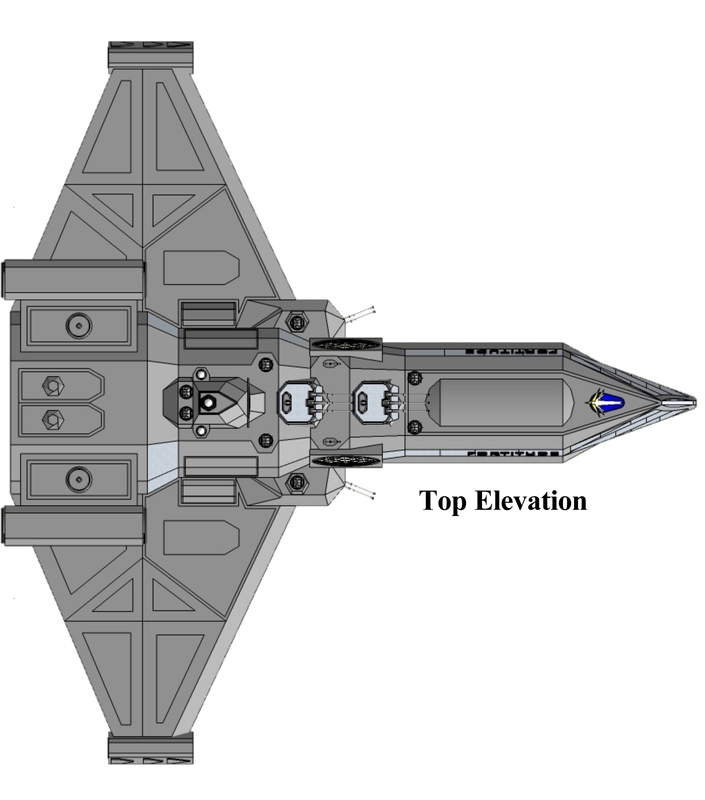 A heavy raider was a concept that had repeatedly been suggested (see entry G2), a vessel not obliged to shrink from combat could do a lot to offset the numerical superiority of the Aèllr Defence Fleet. Additionally, dissatisfaction at the low acceleration of the fleet’s heavy units meant that a fast heavy ship was increasingly seen as desirable. With this in mind, the objective of the refit became to produce a vessel capable of outrunning anything she could not outgun. The modernisation saw the replacement of original Double Zeus engines with Goblin IIIs, plus the complete removal of the sponson mounts. This increase of thrust and reduction of mass increased maximum acceleration by almost eight percent, giving Fortitude a clear acceleration margin over not only anything in her weight class but indeed all but the fastest cruisers. Some sources refer to her from this point as a battlecruiser but the fleet’s designation remained battleship. Officially Fortitude’s role in the event of war would be to act as a cruiser killer, able to chase down lighter units while avoiding heavier opponents. The fleet’s wargames have stressed this role, which in turn was instrumental in the development of the Warspite class fast battleships. However, commentators have postulated that in the event of a second war between Earth and the Aèllr, the ship would have immediately been dispatched over the Confederacy’s border. 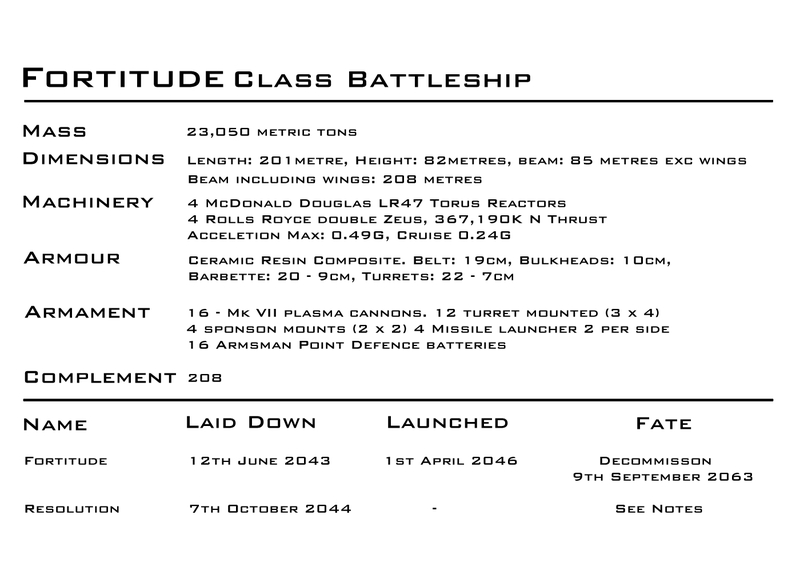 The seriousness of the threat Fortitude presented to the Confederacy’s internal lines of communication was recognised by the Aèllr and can be directly attributed to the development of the Gqrru class, second-class battleships. However Fortitude’s post refit career was to be a short one. In 2063, three years after her modernisation, she was reduced to the reserve, to free resources to allow for the construction of the Warspite class. It is understood that at present the fleet considers Fortitude to be in good condition and has no plans to dispose of her. Fortitude was first and foremost a vessel caught out by a change in technology. While her core design proved solid, the problems with her armament ultimately resulted in a ship that fell far short of her design objectives. Against her likely Aèllr opponents, the only thing she could do better was run. This left her unable to meet her central role. That said, her armament combined with her size and speed certainly meant that she could overawe the lesser powers of the Tample star nations, who during her service career were to prove the most immediate threat. Therefore the perception that Fortitude was essentially a failure is somewhat unfair. While it is true that her weak armament always hamstrung the ship, this is not an error that can be laid at the doors of either the designers or those who commissioned her. Fortitude effectively fell victim to a change in technology that could not have been reasonably foreseen. As the fleet’s first post-war and interstellar battleship, much was learned from both her construction and operation, with the introduction of many features, which at the time were innovative and novel.